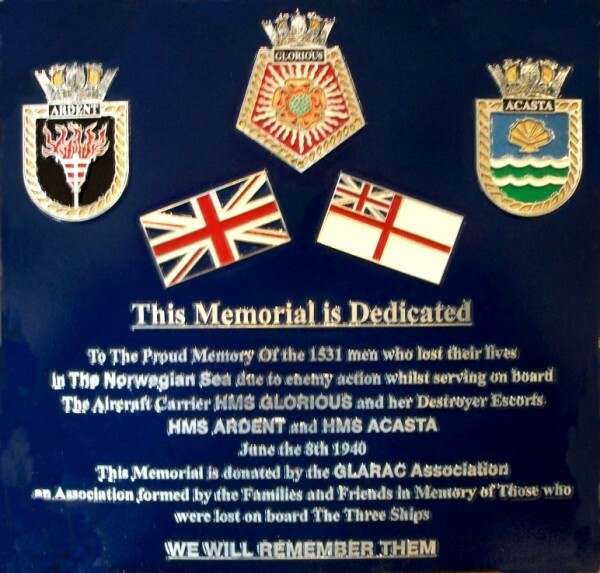 The GLARAC Association founded in 2001 has fulfilled it's intention to provide permanent and lasting memorials to those lost as a result of that fateful day of June 8th 1940. Between 2001 and 2011, the Association provided five such memorial plaques. 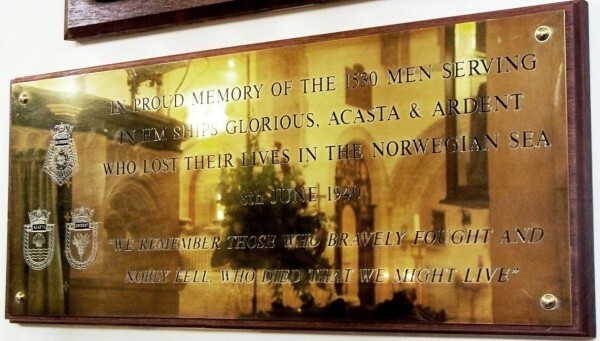 Our first memorial plaque was unveiled in June 2001 at St. Nicholas' church on the HM Naval Base Drake at Devonport. This plaque was unveiled by David Woodcock, son of J.F. Woodcock, Master at Arms, HMS Glorious and was attended by Glorious survivors, Joe Brown, Kenneth Cleave and Fred Thornton. Further to that, a second plaque was unveiled at the National Memorial Arboretum at Alrewas, Staffordshire by Glorious survivor Ron Dowle, who had despite advancing years and health problems directly resulting from his 3 days in an open raft within the Arctic Circle, made the marvellous effort to travel from his home in Australia to fulfil the duty as our guest of honour. 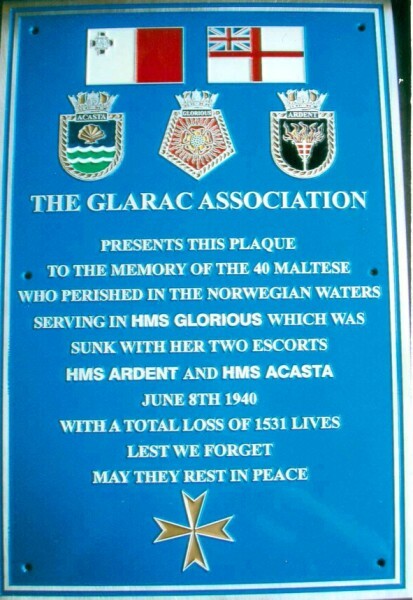 A third plaque was unveiled in Malta in 2008 primarily to honour the 40 Maltese who lost their lives whilst serving onboard the Glorious. This is the greatest single loss of life sufferred by the Maltese who served with the Royal Navy in WW2. This plaque is now permanently displayed at the Maritime Museum at Vittoriosa. The fourth memorial fulfilled one of the aims of the Association, namely to return to Norway for the 70th anniversary of the disaster. 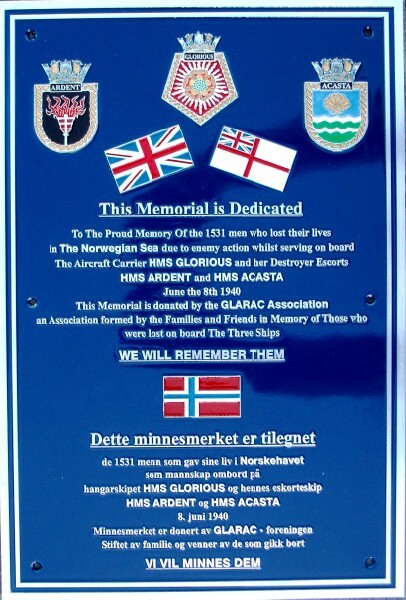 On June 9th 2010 at Trondenes, close to Harstad in Northern Norway, the final port that Acasta and Ardent sailed from to rendevue with Glorious, the Association, with the kind permission of the Norwegian people, unveiled a bi-lingual plaque in the presence of relatives, representatatives of both the Royal Navy, Royal Norwegian Navy, British Embassy and local dignatories. 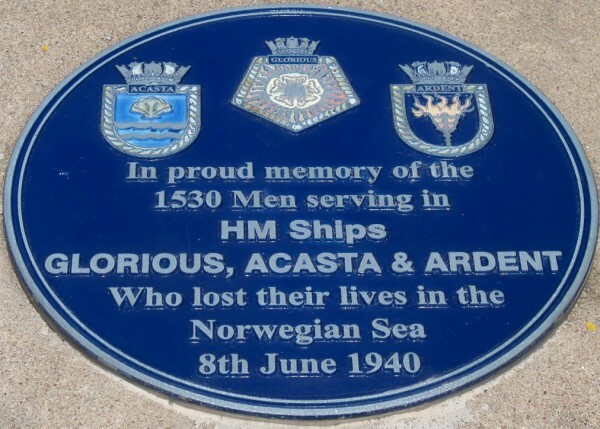 Then in October 2011 the fifth plaque was unveiled at the D-Day Museum at Southsea. The Museum, close to the Portsmouth Naval Memorial that bears the names of those that were lost with the Acasta, is a fitting location.